NOTE: This article is my own personal opinion. It does not reflect the official position or views of any running club or particular running event. The essence of this article is this – whether you’re a runner, volunteer, or both – be nice. Mistakes happen. As I write this blog post I’m in the midst of helping my local running club post online race results and official finishing times for one of our largest local races. This year has been no different than previous years – we have some issues to deal with on race results. Being the results coordinator is a volunteer position which I do because I want to support our running club and local community. 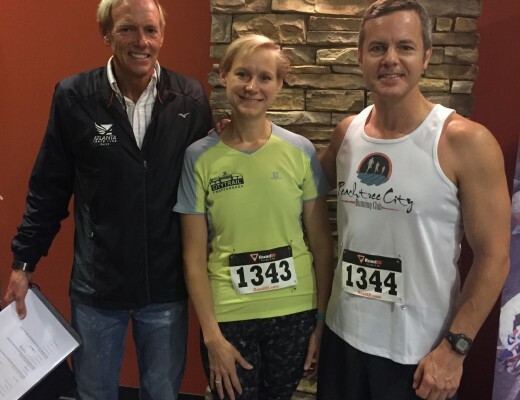 Many readers of this blog know that I am a fairly competitive age group runner, so I’m going to write this article from two perspectives – as a runner and as a race volunteer. I am NOT an official race timer or an expert on race timing technology. I’m merely the guy who helps post and publicize results and relay problematic results to the timing company. First, some basic definitions. Finishing time – Depends on the race, either gun or chip time. Usually gun time is used for overall awards and chip time is used for age group awards. Race distance – if it’s a certified course, this is the actual ground-measured distance of the course running the shortest path possible (cutting the tangents). This can differ from GPS-measured estimates. NOTE: if it’s certified, the course is correct and your GPS isn’t! Scoring – how the race decides how to rank finish time placement and present awards. Award divisions – the categories in which places are recognized, usually overall, master’s and age group. 2014 Peeples 5K – Joe and Mary Catherine both 3rd overall. It’s real simple, if I pay to run a race I can reasonably expect that the official race results will accurately record my finish time. I also expect that I would receive whatever acknowledgement, award or accolade that I might have earned by my performance based on the race’s own rules regarding scoring and awards divisions. I also know that if I run a certified course, that I can expect that the total course distance to be accurate. Individual mile markers placed by volunteers may or may not be accurate, but the total course distance itself will be accurate – even if my own GPS differs. If it’s not a certified course, I know it’s an approximate distance and don’t get too concerned about the true distance. 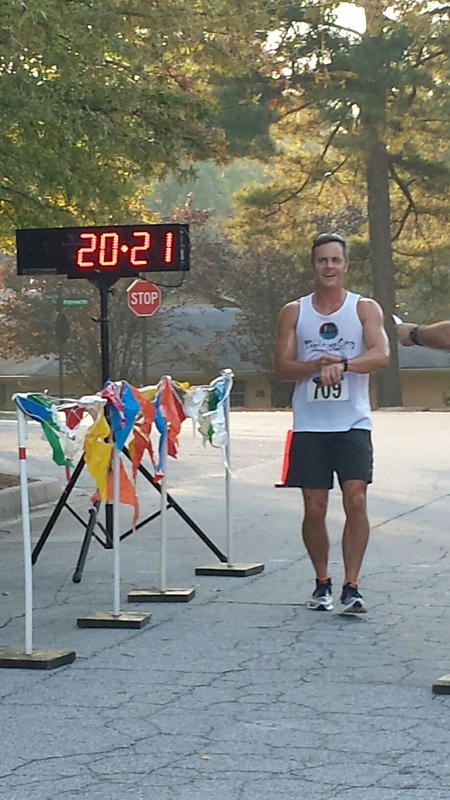 When I finish the race, it’s comforting to see a well organized finish line with a clock showing elapsed gun time. It’s an added bonus if they call out my name. Some of the better organized races provide computer monitors or printed results in a public area so that I can immediately verify that what the timer captured matches what I just saw on the finish clock and my own watch. I don’t worry if there’s not a results listing and will trust the race to “get it right”. Finally, I like it when the race has a quick, efficient, and accurate awards ceremony so I can receive whatever recognition I might be entitled to and get along with my day. I personally don’t get too worked up about awards errors, but I know some people do get upset about awards errors. In my 30+ years of running, I’ve seen and been a victim of race results problems. From a runner’s perspective, here are a few that stand out (not picking on anyone here). In December 2000, I was the first overall finisher of the Brasstown Bald Buster 5K – a giant hill climb up Georgia’s largest mountain. It was the first time I was ever the very first finisher in a race. Yes, in my very first overall win the race director forgot the awards. I got an apology and a handshake. Disappointed? Yes. Mad? No. In 2002 I was doing a 10K race that finished around a track. It was a windy day and it blew down the finishing clock and destroyed it as I approached the finish line. The last numbers I saw were 38:45 (I was younger and faster then). Me and everyone behind me did NOT receive an official finishing time. The race did NOT have a backup plan. It was “runner’s honor” to determine placement, which we did! 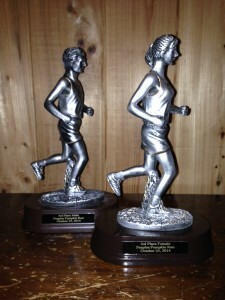 At another recent race, some of the award trophies were broken. The race director made the correct call NOT to have a master’s division since those awards were broken. 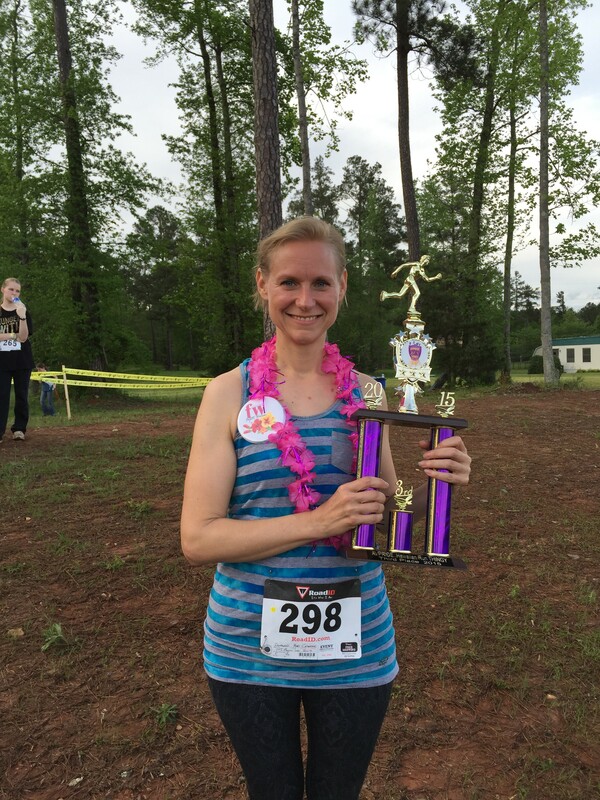 I would have been the first overall master’s finisher – instead I was awarded second place overall (still not a bad award). Usually a first place master’s award “outranks” a second place overall. In another race, which will go unnamed, the race decided to save costs and just simply not time it. The first overall male and female winners were “acknowledged”. No awards or times given – but fun was had by all. 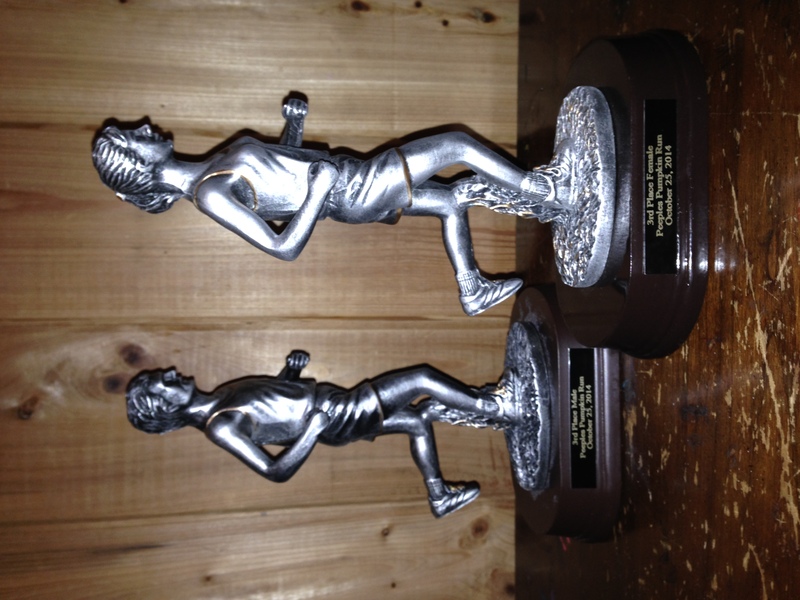 Mary Catherine and I both ran a recent race together in which the race advertised age group awards three-deep. She was the 3rd place finisher in her age group. For reasons unknown to us, the race director just simply decided not to do age group awards (probably to save money since it was low turn-out). We had to go home with just the satisfaction of knowing she placed in her age group without another award to put on our bookcase. 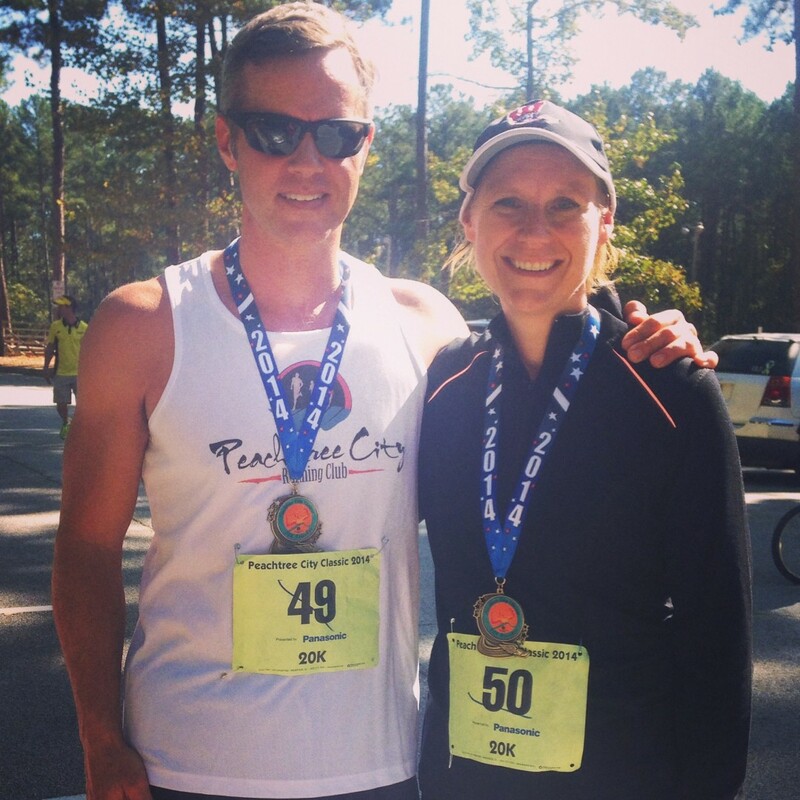 A few years ago I needed a Peachtree Road Race qualifying time. I was thrilled to make “sub-seeded” by running a sub-42 10K. Imagine my disappointment when the “official results” had added a minute to everyone’s times (including my own). They never fixed the problem, so I had to run another race to get an official sub-42 time. In too many races to name, I’ve been given the wrong award (sometimes better, sometimes worse than I earned), no award, or been told awards would be mailed later and they never were. I usually don’t get frustrated unless a race official tells me something, then fails to follow-through. What have I learned as a runner? It’s just a race, which will be past history as soon as I get home. If there’s a problem, I try to use the race’s own contact information and policies to seek remedy. Most of the time races that have results problems make good on fixing those problems. If they don’t follow-through and I’m still upset about it, I just don’t run that race again. 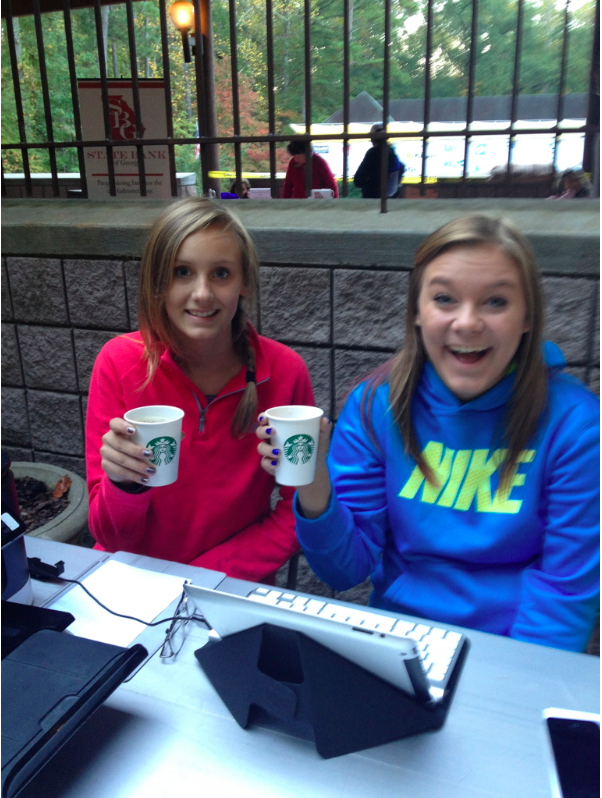 My daughters Tori & Alex working the race results table. I never really knew how races were timed or scored until I started volunteering at races (something EVERY runner should do). Over the years I’ve held about every volunteer position you can imagine up to and including race director. Without a doubt, the hardest job (other than being race director) is managing race results. Some smaller races “self-time” and larger races hire timing companies. Most volunteer positions involve work before and during the race. The results coordinator works during the race and long after it’s over – sometimes months after making adjustments and contacting affected runners. When the race is self-timed, there’s usually only a “gun time” and a finish clock. Finishers received numbered cards which maintain the finish placement. It’s honor system for runners to record their times – which aren’t official anyway. The placement is what is used to score the race. When the race is professionally timed, it’s usually (but not always) electronically timed. Each runner has some kind of RFID tag (chip, electronic strip, sensor) that gets recorded at the finish line and sometimes at the start line to generate a chip time. Unless the timing company is also providing registration services, the timing company is given a race registration database (usually a spreadsheet) from the race registrar (usually a volunteer) that list race numbers, names, and other information. The timing company assigns the serial number of the RFID tags to each race number so that when runners cross the finish, their race numbers are logged. It’s all about the numbers, the timing software simply records times and numbers so the race can be scored. In most cases, the timing system itself works fine. There’s usually a less than 5% error rate – normally due to misplacement of the RFID tag. The best races also provide a manual backup system that records times and numbers via spotters. The backup system is used to adjudicate issues with the primary electronic timing. Although I do not own or manage a timing company, I have been directly involved in managing race results as a volunteer for over 10 years. As I see it, the biggest problems usually involve database management and scoring. It is non-trivial to manage a database of thousands of names – especially when many registrants send in manual registration forms that have to be keyed in by hand. Last minute changes, special requests, corrections to data all make the operation very sensitive. This is why many races have a registration cut-off so that they can lock-down the database for accurate timing. Scoring is the next major problem area and has to do with how the race determines awards. Although there are generally accepted guidelines on age divisions, it’s really up to the race to determine how they want to score races and upon what criteria – chip time or gun time. In almost all cases a chip time will be equal to or faster than a gun time. There have been some very high profile races in which someone received awards based on a faster gun time than someone else who ran a faster race measured by chip time. 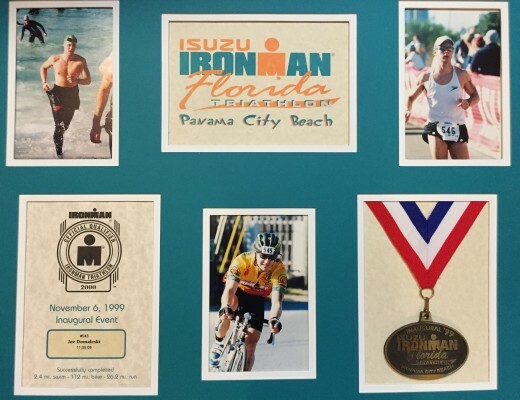 When the desire to compete and win come into play, it makes for a very touchy subject with athletes – I know, because I typically win age group awards at smaller races that I run and have been subject to results problems (as noted at the top of this article). There is also a balance between timeliness and quality when it comes to race timing and scoring. On one hand we know that our runners (and us volunteers who’ve been there all morning) want to have a quick awards ceremony so we can get on with our day. On the other hand, we also want the awards to be given fairly and accurately. At times those two goals come into conflict. From a volunteer’s perspective, here are some notable mishaps that I’ve seen or been a part of over the years. One year I served as race registrar for an event with over 2,500 runners. Most entries were mailed in. I swore to never do it again. Here’s why – people forgot to fill out key information, put in the wrong information and then get upset when the results have their wrong personal information. We saved all of the forms and after the race I even showed a runner the registration form they had sent me – unfortunately that made them even more mad (even though they were in the wrong and forgot to mark their gender). I even had one person request to be left out of the results for fear that an ex-husband was stalking her. Another didn’t want to be listed since they “were too slow”. Fellow runners, if the race is being electronically timed and you know the results are publicly posted – don’t run the race if you don’t want to be in the results! A few years ago at a small church 5K, the timer didn’t show up! He overslept. A mentor and friend of mine, Bob Dalton, was the race director. We had to act fast and assembled a small team and manually “spotted” runners crossing the finish line and wrote down their names and times until we couldn’t keep up with it after the first 25 runners. We were able to award the top places, but not the age groups. During the awards ceremony we placed the age group awards on a table and simply asked people to use the honor system to get the award they thought they earned. No fights broke out (it was a Church after all). We forgave the timer and he came back the following year for free at his insistence. We all make mistakes. When timing chips first came out (the hard plastic ones) runners were told to affix them to their shoes. The first few years of that were rough – they would fall off, runners would carry them in their hand, and many would simply forget to use them. How do you time a race when that happens? You don’t – you’re simply not going to be in the results because you didn’t follow instructions. People don’t like to be told they did something wrong. I’m glad timing systems are mostly part of the race number now so you normally don’t have to worry about it. Sometimes people forget their race number or wear the wrong one. Unfortunately, runners expect the race to “fix” the athlete error. That’s easier said than done. Families especially should double-check that dad doesn’t wear daughter’s number or mom wears husband’s number. Technically, it’s a race disqualification to not wear your number or wear the wrong one. At another race, the database was “off” by 5 rows. The timing was correct, but the finishing times were assigned to the wrong people. It was human error and the person who made the mistake worked with us to fix it. It took a lot of problem solving to figure that one out, but we did. During this past year (2015), the world’s largest 10K (60K+ runners!) 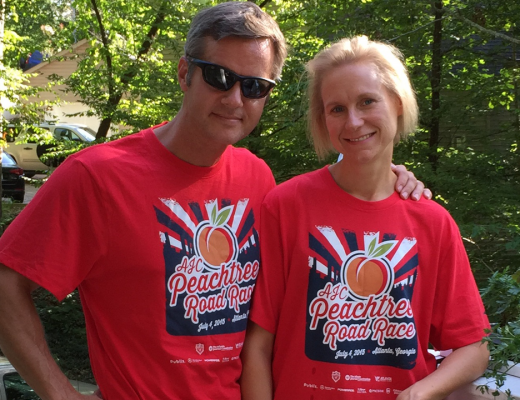 – the Peachtree Road Race had results issues. For the first time in the history of the race, it was halted due to lightning. The front groups of runners finished just fine – that latter groups were affected because the timing system was not halted even though the race was. It eventually got sorted out. Because I’m not a race timer, I normally just volunteer to post the results I’m given up on results boards and online. Every year people want to “kill the messenger” and argue with me about the results. While I’m sympathetic, I need to follow a process to fix the errors. When given your name, gender, estimated finish time and bib number we can fix 99% of the errors that occur. Help me, help you by being calm – but give me your information so we can follow-up. Sorry, we can not stop the awards ceremony nor can we speed it up because you’re tired and want to go home – as a volunteer I’ve probably worked harder than you and certainly have been up longer than you. Nor can we tactfully take an award back from someone and give it to you. How about we just give you a new award? Yes, people ask me things like this. Online results are also problematic. In the old days there were no online results, they were printed in the newspapers (sometimes). Now people expect results to be online instantly and correct at that. We try – we try really hard. As you know from this article, there’s quite a lot of work that goes into producing an accurately timed and scored race. Sometimes races provide the wrong link, the wrong listings, etc. If that happens, be a part of the solution by reporting it as soon as possible and give the race some time to fix it. 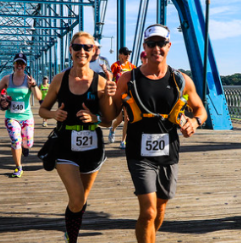 Most races are managed by fellow runners and we take pride in providing a safe, fun, and accurate running experience. Problems ALWAYS happen at every race. As a volunteer, we try to be responsive, fair, and committed to solving those problems. How can you help as a fellow runner? Easy. 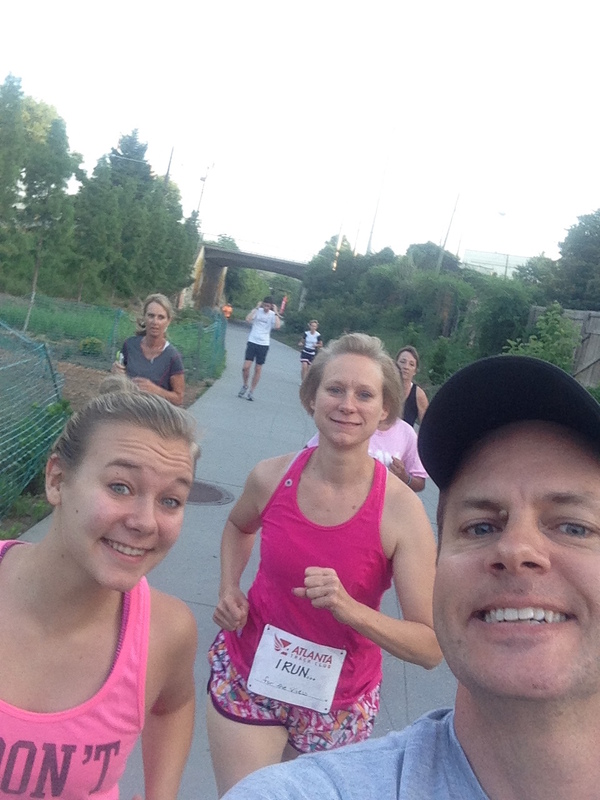 Alex, MC, and Joe running the Atlanta Beltline with the Atlanta Track Club. Double-check your race information prior to the race. Did we spell your name right? Is the information correct? If there’s a problem, let us know prior to the race so we can fix the database. Have a question? Please ask before the race if possible. We want you to focus on the running and not have to worry about the details. Wear the correct number and timing device and wear it properly. No, the timing system won’t pick up the RFID timing device left in your car. If you can go to the race expo, go and double-check your timing device with the timer who’s normally there. They’ll scan it to make sure your name and number come up. Run the correct race and be mindful of your finishing time based on your watch or finish line clock. If results are posted on a board or computer monitor – review them. If there’s a problem – YES, tell us! Be prepared to tell us your name, bib #, gender, race, and estimated finish time. Knowing all of that will help us trouble-shoot and fix the problem. Give us time to fix the problem, don’t expect the race to be halted to fix it immediately. When it comes to awards – relax. Unless you’re trying to qualify for the Olympics or Boston Marathon, it’s just a small medal or plaque in most cases. Yes, I know you worked hard for your award. I do too and have a whole bookcase of running awards myself (except for the 1st place overall plaque from the 2000 Brasstown 5K I already told you about). We want you to get the award you deserve, but sometimes errors happen and it may take us until after the race to figure it out. If you want an award that bad, just contact me and you can have one of mine. Most importantly, please be nice. Don’t get mad at us, yell at us or tell us we don’t know what we’re doing. Actually, we do know what we’re doing but we have to balance your individual need for immediate satisfaction vs. the flow of the entire race. Keep in mind we’re just like you – fellow runners. If you do the above things, you’ll find the race to go more smoothly and that problems get solved faster and more accurately.